Buy Bakson's Homeopathy Kof Aid Syrup Treats Dry, Spasmodic, Allergic, Congestive Cough of Bronchitis & Asthma, Soothes Throat & Aids Expectoration. Worldwide Free Shipping. For dry, productive, allergic, wheezy cough associated with various disorders. 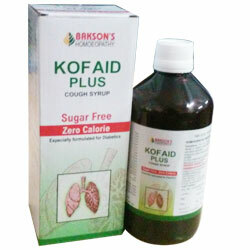 Bakson's Kof Aid Plus is a combination of homoeopathic remedies, which provides quick relief from cough associated with various disorders including Asthma without any side effects. It does not cause drowsiness and is completely safe for children and daytime use. For dry, productive, allergic and wheezy cough associated with variouos disorders. Adults : 1 tablespoon of syrup every, 3-4 hours. Children : 1 teaspoon of syrup every, 3-4 hours.